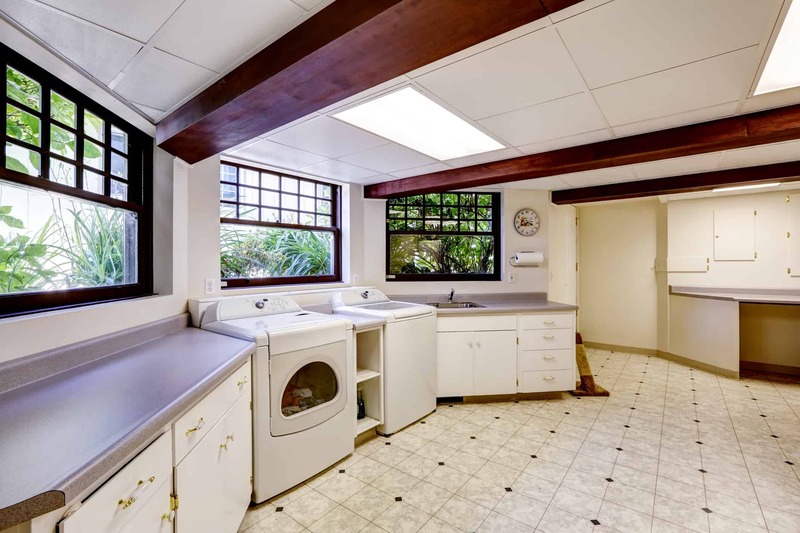 Aside from the bathroom, bedroom and kitchen, the laundry room is actually one of the most visited rooms in the home. Yet the laundry room seems to be last on the list for homeowners to invest in. If you have a family, it’s safe to say you might be in the laundry room on a daily basis; therefore, even more reason to give it a little more love. Your laundry room makeover will certainly lift spirits in the entire household. Basically, if you can give this room a little more, laundry may be a chore no more! Minimizing time spent in the laundry room is usually the consensus of most homeowners. But what if you transformed your laundry room into a more attractive, multi-tasking room that would make laundry seem like a breeze? Installing a long countertop or island for folding is the first way to streamline your laundry duties. Adding plenty of cabinetry and drawers will keep all your laundry supplies organized. Pull out drawers to hide dirty laundry baskets are a great way to keep your room looking tidy. Pull down drying racks, cubbies with hooks, hanging racks are also great add-ons. Installing a sink in the laundry room makes it very convenient for handling fine washables or washing off muddy boots etc. Installing a window or skylight is a great idea to make your household hub more inviting. You can cheer up your laundry room with a fresh coat of paint in a fun color–even just splashing one wall or the laundry room door can do wonders. If you’re stuck on laundry duty, you can still multi-task with a built-in computer desk area ideal for getting office or school work done. Kill two birds with one stone by organizing mail or filing while you’re doing laundry. Dog lovers can incorporate doggie facilities within your laundry room such as a doggie shower. A doggie shower can also be helpful rinsing off your little ones after outdoor play so they can keep the “mud in the mud room”. Finally, some colorful décor in your laundry room is a great finishing touch to make your laundry room move lovable. Hobby stores often have a great selection of laundry wall art you’ll find fun and amusing. Sprucing up your laundry room can be an artistic good time for the whole family, and your Las Vegas Contractor can help you get started on making your laundry room a room you can truly love!